Modern’s Removal: Blessing or Curse? You sit down to fill out the last few slots of your generic three-color midrange brew. You’ve responsibly dedicated seven slots to removal; now what? You’ve heard Lightning Bolt is good, but is it really the best option in 2017? What’s a mage to do? 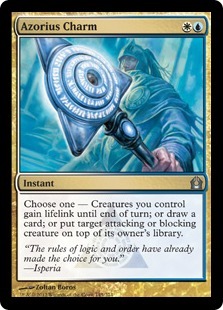 Today, we’ll be using theory and analysis in combination to frame a fresh discussion around one of the most influential tenets of Modern Magic: removal. With Amonkhet set to shake things up as we speak, I figured now is as good a time as any to talk about ever-present, unchanging Magic principles. As we all know by now, a particular spell’s success or failure is just as dependent on context as it is on rate or power. As Modern remains primarily a format where you die by being dealt 20 damage, a summary and discussion on the best means to prevent said damage sounds appropriate. Let’s get to it! Wild Nacatl is a powerful creature, which pushes opponents to play Lightning Bolt to fight it. Lightning Bolt is a fine answer to Wild Nacatl, which discourages opponents from playing Wild Nacatl. This is the circle of life in Modern; a symbiotic relationship between creature and kill spell. Both options are powerful enough on rate alone to see play regardless of context, but their relative worth can rise and fall depending on multiple factors. If Lightning Bolt is all over the format, Wild Nacatl’s relative strength worsens (slightly) while other options get better. Monastery Swiftspear, Goblin Guide, Strangleroot Geist, and Experiment One (to an extent) all perform similar functions, but in slightly different ways that have cascading repercussions (or benefits) depending on how they align with the format. The most recent example of this philosophy in practice is the mismatch between Tasigur, the Golden Fang and Fatal Push. Fatal Push has had three months to affect Modern, and is the primary reason why manlands are down, delve creatures are up, and Death’s Shadow aggro is kept in check. The card is powerful, so it sees heavy play—in return the format shifts organically to respond to its effects. Tasigur, the Golden Fang, Reality Smasher, Gideon Jura, and Lingering Souls are some of the best ways to fight Push. Now, all of these cards saw play before Fatal Push, and Fatal Push is still seeing play despite their presence. Great cards stay great; it’s the cascading effects we need to watch out for. This is a game of inches, one where Esper Control is a slightly better metagame choice than UW Control based on the specific cards that other archetypes are employing to adjust into a better position against the field. Intricacies, also known as the absolute best part of Magic. Here are the most popular, unique and effective non-sweeper options to handle creatures in Modern. By no means is this list exhaustive, but for the most part there should be a comp here for whatever spell you might need in a certain situation. Modern is defined by mana efficiency, so for the most part one-mana removal spells are conditional, two-mana unconditional, and three-mana unconditional with a chance for some value attached. For more on this, refer to my first article ever written on this site for 1500 words on this topic alone. As a good rule of thumb, most creatures in Modern follow a similar pattern; one mana for a weak threat, two mana for a threat with some resiliency, three mana for value. A creature that can “trade up” across the chart is considered strongly positioned, while one that trades down is relatively weak. The best way to illustrate this is through examples. Knight of the Reliquary is actually a strong option in a Lightning Bolt-dominated format, but lines up poorly against Terminate (two-mana answer for a three-mana threat). One-mana threats are baseline neutral because, worst case, they will always generate at least a mana’s worth response from the opponent (unless you play into a sweeper, which is why sweepers are awesome). Until a couple months ago, Tarmogoyf was the gold standard for two-mana threats because a good one-mana solution to the threat that didn’t give back some form of value just didn’t exist. Path to Exile gave a land, Dismember gave it haste, Condemn and Oust were too conditional to be played. Playing a threat with the security that it would at least be answered evenly was for a long time the closest thing to a safe bet, like that one time I doubled $50 on 11 playing blackjack. I lost that hand, and Tarmogoyf has as well, thanks to Fatal Push. Among these options, the best, cheapest, mono-color option that reliably trades up the chart is surprisingly Strangleroot Geist. Thanks to haste, it is always generating some form of value in every situation that doesn’t involve Path to Exile. Unfortunately, it’s in the worst color. Voice of Resurgence is more powerful, and probably just as playable, as every deck that plays green usually plays white as well. Remember, the idea here isn’t to “blank” removal; that’s impossible for the most part. We don’t play Wild Nacatl in the hopes that our opponent just “doesn’t have it” and we get to hit for four turns un-impeded. We play Wild Nacatl because (before) it put our opponent on a four-outer: have Lightning Bolt or take some damage. Even if they do have it, we have more creatures to play. It’s a numbers game; if we wanted to overload removal we’d play Young Pyromancer in every red deck. The goal is to attempt to line up our threats as awkwardly as possible to our opponent’s answers, and vice versa. As is the case with every rule that doesn’t involve mathematics, outliers exist. Detention Sphere on paper is bad; unless we’re getting multiple cards’ worth of value out of the spell, we’re at a disadvantage. Detention Sphere’s true strength is latent—it gives us flexibility, often in archetypes that need it the most. UW can handle all the creatures you can throw at it; you can’t say the same about Blood Moon, Keranos, God of Storms, and Liliana of the Veil. Three mana might be “overpaying” 80% of the time, but if it gets us to our lategame or solves the issue at hand, it’s worth it every time. This is why Jund plays Maelstrom Pulse, and why Grixis would as well if it were on-color. No, we’re not packing four and beaming about it to our mothers, but we’ll play a copy or two to get the job done. Contrary to popular belief, Condemn is great against Death’s Shadow. It answers every creature they have, can strand future Death’s Shadows, and can even two-for-one. It dodges placing the creature in the graveyard to be returned later with various synergies. Still, it falls behind Path to Exile and Fatal Push. They will always be attacking, obviously, but there are narrow windows when we can’t Condemn, and Death’s Shadow’s numerous discard spells can take it away. Death’s Shadow is normally leading with a discard spell to start the game, which means they’re taking whatever removal spell we have in hand before a creature hits the board regardless, so in that scenario, Condemn and Path to Exile are the same. The issue, of course, is when they play discard before attacking, after they have a creature on the board. We could have drawn the Condemn that turn, we could have had it in hand—regardless, if they have a discard spell at their disposal, they will get a chance to take our Condemn before we have a chance to use it. How it usually plays out in games is slightly different, but it’s important to recognize what’s happening under the surface. Often we have more than one piece of removal in hand, just like they often have more than one piece of discard. Still, it’s these sorts of intricacies that can often be the difference between winning and losing games. Burn is pretty much the only archetype utilizing haste at this point. Oust is something to consider, but only as a worst-case scenario. Second from the top is just two turns away, which places Oust somewhere between Terminate and Vapor Snag. Both of those spells are on this list, but that’s not where I want to be while Condemn is still a strong option. Azorius Charm has seen minor play before, but that was in a format dominated by Tarmogoyf, where the only playable on-color answers were Path to Exile and Spell Snare. Currently, it’s a more expensive Condemn that can draw us a card if we need it. Were the format to get more diverse and less creature-based, I could see this pop up as a less efficient option that isn’t dead in non-creature matchups. But for now, its still pretty far away from the radar. With all this information, where do we go from here? Everyone knows about Tasigur to fight Fatal Push by now. What happens as a result of this change? Generating tokens has always been one of the best ways to answer one-for-one removal. Black decks now have a one-mana option that can boast efficiency with the likes of Path to Exile and Lightning Bolt, and against 80% of the creatures in Modern Fatal Push is probably better. That’s a big deal, so I would expect these “shifts” we’re seeing to be relatively permanent unless something big changes things up. Keep an eye out for “strange” options like Kird Ape or Geist of Saint Traft that are obvious responses to fight the removal people are playing. Fatal Push is too resilient to blank completely, but minor changes to creature bases can result in drastic positional shifts. When removal becomes too much for creature decks, the next logical step is for creatures to stop coming out to play like the cowards they are. We are seeing Dredge come back into the light, and it looks like Ad Nauseam might be getting a boost as well. It’s possible, but perhaps Fatal Push might be “too strong” and cause creature decks to decline across the board in favor of combo. Time will tell, and part of the blame should definitely be given to Dredge itself, but we might look back on this period in a few months and point to Fatal Push as the culprit that pushed Modern further into combo-land. So, for the foreseeable future, Modern will continue to be manipulated by Fatal Push and those trying to next-level it. Tasigur, the Golden Fang and Lingering Souls will remain the primary means to fight the removal spell, which in turn will keep creature decks from becoming obsolete. That’s slightly tongue in cheek, but it isn’t difficult to imagine a format without delve and flashback, where the reactive decks can play four Lightning Bolt and four Fatal Push and keep creatures decks pinned. While aggro and midrange are looking to level each other on card choice, keep an eye out for combo to go over the top of both. I have noticed that no one has commented on recent articles and just wanted to say this is my favorite Mtg-related website. Keep up the good work !! Thanks for reading, and thanks for stopping by!